I can tell, just this week Eamonn have been booked up for 3 clinic/show during the summer. And we looking forward!!! Thank you for your trust! We will do our best! 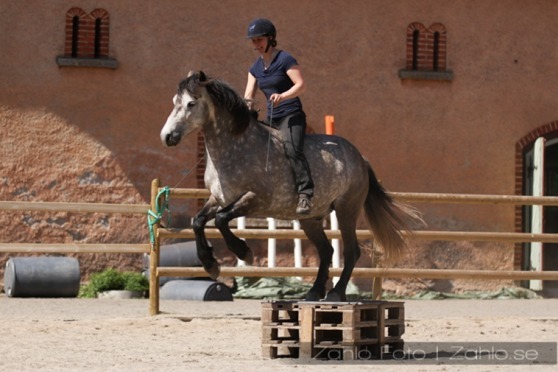 Todays lesson, in the riding arena. Make sure the horse really can relax and respond, before you take the next step in the education. This week focus is to start ride without bridle/halter. That dosent mean, take if of, take a chance, and see what happends. No, that means, make sure you and your horse will succes when the times come to take it of. So today the student have teached there horses to stay calm also when something is a bit scary. Like a plastic bag attached in a long rope. So the rider was able to ride and drag the plasticbac and the horse could still stay calm under this "pressure".